A photo, taken at Cypress Elementary in the Lakeside Community, in Kissimmee, FL, submitted to the Free Thought Project this week, paints a very disturbing picture. He had difficulty being redirected which resulted in a really bad meltdown. My son made threats to harm himself with scissors which were accessible to him from the teacher’s desk. The principal did not call us, but did call law enforcement to have him Baker acted. When three law enforcement officers arrived to the classroom, Ryan was still very upset. 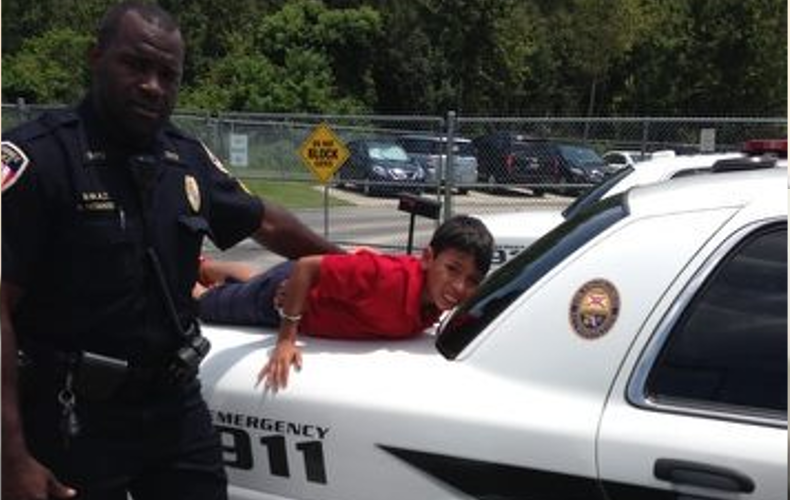 They proceeded to drag him down the hall, passed by my husband who was very upset and placed him on the trunk of the police car on one of the hottest days of the week (100 degrees if not higher – police officer states this in his report ) and handcuffed him in front of the school and held him down on the hot car for several minutes before communicating to my husband that they planned to baker act him. The Florida Mental Health Act of 1971, commonly known as the Baker Act allows the involuntary institutionalization and examination of an individual. It can be initiated by judges, law enforcement officials, physicians, or mental health professionals. Basically this child was going to be taken from his parents, against their will, by cops, acting on behalf of a school principal, and put into state custody for displaying behavior that parents of autistic children are all too familiar with. 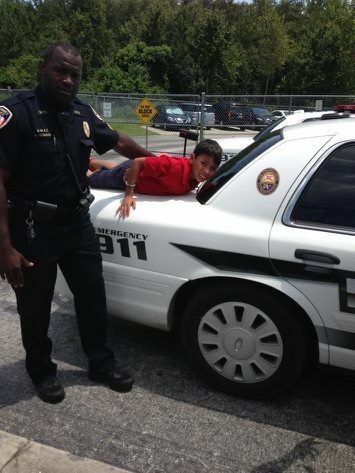 According to the police report, the boy was thrown on top of the car because the pavement was too hot. Apparently the car, in 100+ degree Florida weather, was a welcomed cooling zone. The fact that police were called to a school because teachers could not control a 10 year old speaks to the level of incompetence and lack of training within the school. Also the fact that the principal would not allow Ryan’s dad to see his son, and possibly diffuse the situation prior to his son being cuffed and stuffed, shows just how dependent the system is on the application of state force. The fact that the principal refused to allow a father to see his son, and waited until police arrived is a disturbing symptom of a much larger systemic problem. This problem has to do with society’s dependence upon state sanctioned force to solve problems. This dependency is so strong that the principal would not even let the boy’s own father try and calm his son. He could not see that as a solution; the only solution (in this principal’s mind) was that of state force. The family is however, planning on taking legal action against the school because they claim the principle violated their parental rights.